I play "Hit it Rich", Willy Wonka and the Chocolate Factory", "Black Diamond Casino", and "Wizard of Oz". 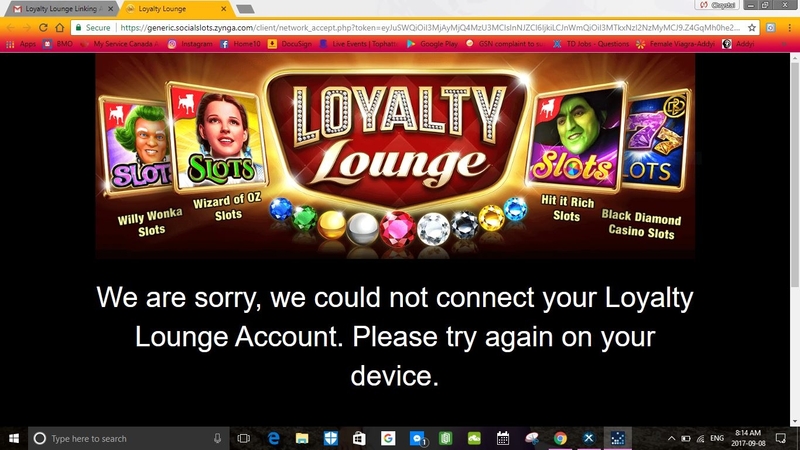 I attempted to put them all on the new "Loyalty Lounge", I received the email verifying that I signed up for the "LL" but when I attempt to verify my accounts, I keep getting an error message, I have a screen shot of the message I am getting. I have been continuously trying to verify my account for hours now. So I'm unable to benefit from the LL, but I did not receive any bonus coins for signing up, the only Casino that rewarded me with $2,000,000.00 was "Wizard of Oz". How can I have access to the "LL" in each Casino, without verifying my account for each or is there is another page I can open to verify my account? I attempted to use the Support within the game, but there was no option to contact your support team directly, it was just FAQ & A's. Where can I get some answers? Appreciate your report, @N8ivechick. To check your account further, please refer to this article on how to contact our Support team. Are you using a mobile device or a desktop when contacting them?